Musa sikkimensis is a hardy banana that makes an excellent addition to the subtropical border of your garden. It forms a strong and vigorously growing foliage plant with large oval leaves that have burgundy markings. It is tolerant of most growing conditions, although it will produce the best display if planted in well draining, but moist, soil. It tolerates windy conditions and can be grown in the cool greenhouse or sheltered border. Plants can be raised from seed sown in spring, although they can be slow to germinate. 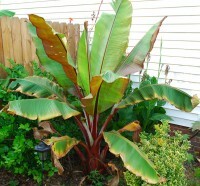 The Gran Nain banana plant is a fast growing banana plant that gets 6 to 8 feet tall and solid green in color. 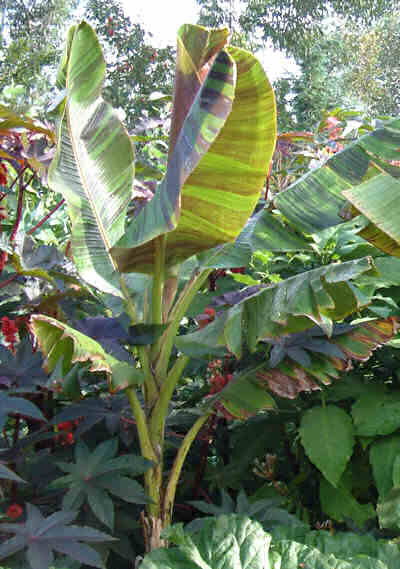 There is some red variegation in juvenile plants but that disappears as the banana plant matures. 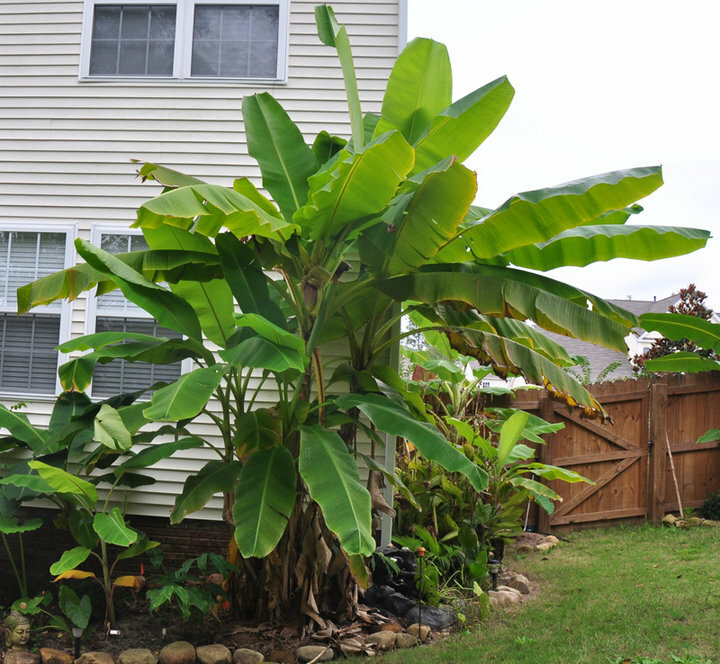 This banana is prized for both its foliage and its large fruit (up to 1ft in length). Ideal for the patio or near swimming pools. It is also a widely grown commercial crop, and if you buy Chiquita bananas, odds are, this is the variety of banana you are purchasing. Abyssinian banana is in the banana family and it looks a lot like a banana (Musa), but it is not a banana and it does not produce any edible fruit. 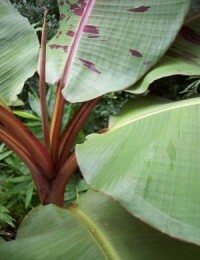 The plant is an herbaceous perennial with huge leaves shaped like giant boat paddles. The leaves can be 20 ft long and 3-5 ft wide. Huge might be an understatement. The leaves are bright olive-green and the midribs on the undersides are maroon. The leaves emerge from the center of the plant on a short trunk-like pseudo-stem, so that the plant's overall height is usually little more than the length of a single leaf. Fruits look like little dry bananas but are not good to eat. 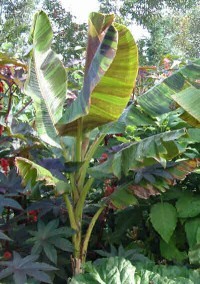 The cultivar 'Maurelii' has reddish leaves and red leaf stalks while the cultivar 'Montbeliardii' is tall and slender with narrow leaves and black midribs. 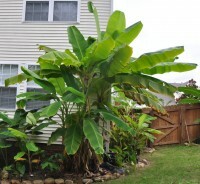 Musa Basjoo is an incredibly hardy banana and is an excellent plant for adding that instant tropical splash to a yard. Musa Basjoo aka the Japanese Fiber Banana can actually be grown in all 50 states, withstanding temperatures down to 20 below F. They'll also multiply (or pup) regularly, which gives you even more Basjoo to spread around. In zones above 7 the basjoo may died back to the ground each winter. But warmer zones 7-9 will typically see much of the pseudo-stem survive the winter above ground.